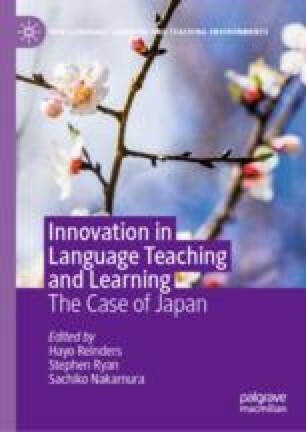 This chapter examines self-access learning and advising, which are two interconnected areas of innovation taking place in language education in Japan. After a brief summary of some key points related to learner autonomy and learning beyond the classroom, the author gives a general overview of self-access and advising. This includes a discussion of how and why self-access and advising are being introduced in Japan, and how self-access in Japan is operationalised. The chapter also explores how colleagues in Japan are innovating in seven areas of self-access: staff development, attracting student users, developing social learning communities, advocating voluntary participation, language policy, space design, and self-access materials. The ‘lessons learned’ sections indicate where future directions for the field lie. I am grateful to feedback, suggestions and references from Curtis Edlin, Huw Davies, Satoko Kato, David McLoughlin and the editors of this volume on earlier drafts of this chapter. Allhouse, M. (2014). Room 101: The social SAC. Studies in Self-Access Learning Journal, 5(3), 265–276. Retrieved from https://sisaljournal.org/archives/sep14/allhouse/. Allhouse, M. (2015). Room 101: A movement towards social learning spaces? A survey of SAC managers in UK higher education. Studies in Self-Access Learning Journal, 6(1), 124–137. Retrieved from https://sisaljournal.org/archives/mar15/allhouse/. Benson, P. (2017). Language learning beyond the classroom: Access all areas. Studies in Self-Access Learning Journal, 8(2), 135–146. Retrieved from https://sisaljournal.org/archives/jun2017/benson/. Bibby, S., Jolley, K., & Shiobara, F. (2016). Increasing attendance in a self-access language lounge. Studies in Self-Access Learning Journal, 7(3), 301–311. Retrieved from https://sisaljournal.org/archives/sep16/bibby_jolley_shiobara/. Bonner, E., & Frazier, E. (2018). Creating an augmented reality app for an enhanced self-access tour. Relay Journal, 1(1). Retrieved from https://kuis.kandagaigo.ac.jp/relayjournal/issues/jan18/bonner_frazier/. Burke, M., Hooper, D., Kushida, B., Lyon, P., Mynard, J., Sampson, R., & Taw, P. (2018). Observing a social learning space: A summary of an ethnographic project in progress. Relay Journal, 1(1). Retrieved from https://kuis.kandagaigo.ac.jp/relayjournal/issues/jan18/burke_et_al/. Central Council for Education. (2012). Qualitative transformation of undergraduate education. Retrieved from http://www.mext.go.jp/component/b_menu/shingi/toushin/__icsFiles/afieldfile/2012/10/04/1325048_1.pdf. Chen, A., & Mynard, J. (2018). Student perceptions of the English lounge after a layout change. Relay Journal, 1(1). Retrieved from https://kuis.kandagaigo.ac.jp/relayjournal/issues/jan18/chen_mynard/. Cooker, L. (2010). Some self-access principles. Studies in Self-Access Learning Journal, 1(1), 5–9. Retrieved from https://sisaljournal.org/archives/jun10/cooker/. Croker, R., & Ashurova, U. (2012). Scaffolding students’ initial self-access language centre experiences. Studies in Self-Access Learning Journal, 3(3), 237–253. Retrieved from https://sisaljournal.org/archives/sep12/croker_ashurova/. Dam, L., Eriksson, R., Little, D., Miliander, J., & Trebbi, T. (1990). Towards a definition of autonomy. In T. Trebbi (Ed. ), Third Nordic workshop on developing autonomous learning in the FL classroom. Bergen, Norway: University of Bergen. Retrieved from https://www2.warwick.ac.uk/fac/soc/al/research/groups/llta/research/past_projects/dahla/archive/trebbi-1990.pdf. Edlin, C. (2016). Informed eclecticism in the design of self-access language learning environments. Studies in Self-Access Learning Journal, 7(2), 115–135. Retrieved from https://sisaljournal.org/archives/jun16/edlin/. Edlin, C., & Imamura, Y. (2018). Resource coordination in the Self-Access Learning Center at Kanda University of International Studies for the 2017–2018 academic year: Activity, concept, and expanding definitions. Retrieved from https://kuis.kandagaigo.ac.jp/relayjournal/issues/jan18/edlin_imamura/. Gardner, D. (2011). Looking in and looking out: Managing a self-access centre. In D. Gardner (Ed. ), Fostering autonomy in language learning (pp. 186–198). Gaziantep, Turkey: Zirve University. Retrieved from http://ilac2010.zirve.edu.tr. Gillies, H. (2010). Listening to the learner: A qualitative investigation of motivation for embracing or avoiding the use of self-access centres. Studies in Self-Access Learning Journal, 1(3), 189–211. Retrieved from https://sisaljournal.org/archives/dec10/gillies/. Holec, H. (2000). Le C.R.A.P.E.L. a travers les ages [CRAPEL through the ages]. Mélanges, 25, 5–12. Retrieved from http://www.atilf.fr/IMG/pdf/02_holec.pdf. Hooper, D., Burke, M., Taw, P., & Mynard, J. (2017, December). Understanding what makes a community of practice in an English conversation lounge. Paper presented at the annual conference of the Japan Association for Self-Access Learning, Kanda University of International Studies, Japan. Retrieved from https://docs.google.com/presentation/d/1XiJ6SpKHd1SGJvu65sJkkD4LBOWSeuQcigWOSCH6NoU/edit. Hughes, L. S., Krug, N. P., & Vye, S. (2011). The growth of an out-of-class learning community through autonomous socialization at a self-access center. Studies in Self-Access Learning Journal, 2(4), 281–291. Retrieved from https://sisaljournal.org/archives/dec11/hughes_krug_vye/. Imamura, Y. (2018). Adopting and adapting to new language policies in a self-access centre in Japan. Relay Journal, 1(1). Retrieved from https://kuis.kandagaigo.ac.jp/relayjournal/issues/jan18/imamura/. Ito, H. (2017). Rethinking active learning in the context of Japanese higher education. Cogent Education, 14(1). Retrieved from https://doi.org/10.1080/2331186x.2017.1298187. Kato, S. (2017). Effects of drawing and sharing a ‘picture of life’ in the first session of a mentoring program for experienced learning advisors. Studies in Self-Access Learning Journal, 8(3), 274–290. Retrieved from https://sisaljournal.org/archives/sep2017/kato/. Kimura, H. (2014). Establishing group autonomy through self-access center experiences. Studies in Self-Access Learning Journal, 5(2), 82–97. Retrieved from https://sisaljournal.org/archives/june14/kimura/. Mayeda, A., MacKenzie, D., & Nusplinger, B. (2016). Integrating self-access centre components into core English classes. Studies in Self-Access Learning Journal, 7(2), 220–233. Retrieved from https://sisaljournal.org/archives/jun16/mayeda_mackenzie_nusplinger/. Ministry of Education, Culture, Sports, Science and Technology. (2015). Plans on the promotion of improvement of students’ English abilities. Retrieved from http://www.mext.go.jp/en/news/topics/detail/1378469.htm. Murray, G. (2017). Autonomy and complexity in social learning space management. Studies in Self-Access Learning Journal, 8(2), 183–193. Retrieved from https://sisaljournal.org/archives/jun2017/murray2/. Mynard, J. (2016a). Self-access in Japan: Introduction. Studies in Self-Access Learning, 7(4), 331–340. Retrieved from https://sisaljournal.org/archives/dec16/introduction/. Mynard, J., Lyon, P., Kushida, B., & Sampson, R. (2017, December 16). How different students use and perceive an English conversation lounge: An ethnographic study. Paper presented at the annual conference of the Japan Association for Self-Access Learning, Kanda University of International Studies, Japan. Retrieved from https://drive.google.com/open?id=1jurK6JYKLhqV-OV_3OHXSrVk3IYjjwac7_gfB4eyFzM. Otani, M. (2013). Communicative language teaching in English at Japanese junior high schools. Bulletin of Soka University Graduate School, 35, 285–305. Retrieved from https://www.soka.ac.jp/files/ja/20170429_001652.pdf. Reinders, H. (2012). The end of self-access? : From walled garden to public park. ELTWorldOnline.com, 4. Retrieved from http://blog.nus.edu.sg/eltwo/2012/06/13/the-end-of-self-access-from-walled-garden-to-public-park/. Rutson-Griffiths, Y., & Porter, M. (2016). Advising in language learning: Confirmation requests for successful advice giving. Studies in Self-Access Learning Journal, 7(3), 260–286. Retrieved from https://sisaljournal.org/archives/sep16/rutson-griffiths_porter/. Shibata, S. (2016). Extensive reading as the first step to using the SALC: The acclimation period for developing a community of language learners. Studies in Self-Access Learning Journal, 7(3), 312–321. Retrieved from https://sisaljournal.org/archives/sep16/shibata/. Takeuchi-Okuno, H. (2010). The regulation of fixed-term employment in Japan. Labour policy on fixed-term employment contracts, 2010 JILPT Comparative Labour Law Seminar (pp. 69–84). The Japan Institute for Labour Policy and Training. Retrieved from http://www.jil.go.jp/english/reports/documents/jilpt-reports/no.9.pdf. Tanaka, T. (2009). Communicative language teaching and its cultural appropriateness in Japan. Doshisha Studies in English, 84, 107–123. Retrieved from https://doors.doshisha.ac.jp/duar/repository/ir/14214/020000840005.pdf. Taylor, C., Beck, D., Hardy, D., Omura, K., Stout, M., & Takandis, G. J. (2012). Encouraging students to engage in learning outside the classroom. In K. Irie & A. Steward (Eds. ), Learner Development SIG Realizing Autonomy Conference Proceedings. [Special issue] Learning Learning, 19(2), 31–45. Retrieved from http://ld-sig.org/LL/19two/taylor.pdf. Thompson, G., & Atkinson, L. (2010). Integrating self-access into the curriculum: Our experience. Studies in Self-Access Learning Journal, 1(1), 47–58. Retrieved from https://sisaljournal.org/archives/jun10/thompson_atkinson/. Thornton, K. (2016). Promoting engagement with language learning spaces: How to attract users and create a community of practice. Studies in Self-Access Learning Journal, 7(3), 297–300. Retrieved from https://sisaljournal.org/archives/sep16/thornton/. Torikai, K. (2001). English language education in Japan: Issues and insights. In R. Long, G. van Troyer, K. Lane, & M. Swanson (Eds. ), On JALT 2000: Towards the new millennium. The Proceedings of the JALT 26th annual international conference on Language Teaching & Learning and Educational Materials Expo, Tokyo, November 2000 (pp. 9–13). Tokyo, Japan: JALT. Retrieved from http://jalt-publications.org/archive/proceedings/2000/jalt2000.pdf. Yamamoto, K. (2018). The journey of ‘becoming’ a learning advisor: A reflection on my first-year experience. Relay Journal, 1(1), 108–112. Retrieved from https://kuis.kandagaigo.ac.jp/relayjournal/issues/jan18/yamamoto/. Yamashita, H. (2015). Affect and the development of learner autonomy through advising. Studies in Self-Access Learning Journal, 6(1), 62–85. Retrieved from https://sisaljournal.org/archives/mar15/yamashita/.